Using the included instructions, children can learn how to make their own crafts for years to come. They will learn all of the valuable skills to become more talented at arts & crafts as a whole. By showing how young crafters can use the included supplies, they’ll also form new hobbies and develop skills that they can bring to future projects. This safe and fun kit makes the perfect gift for one child or a great team activity for small groups of children at parties. Art and creative work are beneficial for children because they enhance their imagination and foster healthy learning habits. 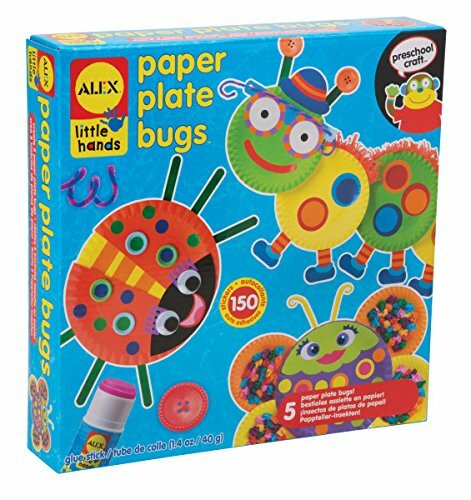 Let your child chose from over 100 different stickers with this kit that fosters imagination and increases creativity. Following instructions instills patience and playing with the puppets will teach kids how to appreciate the final product of their hard work. This kit comes with 150 stickers and shapes, a pair of eyes, 6 pipe cleaners, 2 pom poms, fringed paper, crinkled paper, 10 craft sticks, 6 buttons, 125 sheets of tissue and easy picture instructions. Alex Toys has become the preeminent manufacturer of children’s products and with over 1,000 unique items, Alex makes toys for every age group, from toddlers to teens and everything in-between. With toys in the baby, fashion, crafts and misc. categories, Alex makes toys that encourage a lifetime of learning. Alex Toys are currently sold worldwide in over 80 countries through specialty retail stores, catalogs and websites.